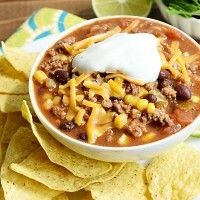 Slow Cooker Taco Soup - Home. Made. Interest. This Slow Cooker Taco Soup is made with ground beef, black beans, and corn, slow-cooked in a spicy broth for a great Tex-Mex flavor. This Slow Cooker Taco Soup recipe was one of my grandma’s favorite easy dinners, and she used to make it all the time. The broth is flavored with ranch dressing and taco mix, and combined with tomatoes, black beans, and corn, so it has a Tex-Mex flavor and, since we make it in the slow cooker, it doesn’t heat the kitchen up. It’s just a bonus that it goes perfectly with a few icy cold margaritas. What Ingredients Go In Taco Soup? 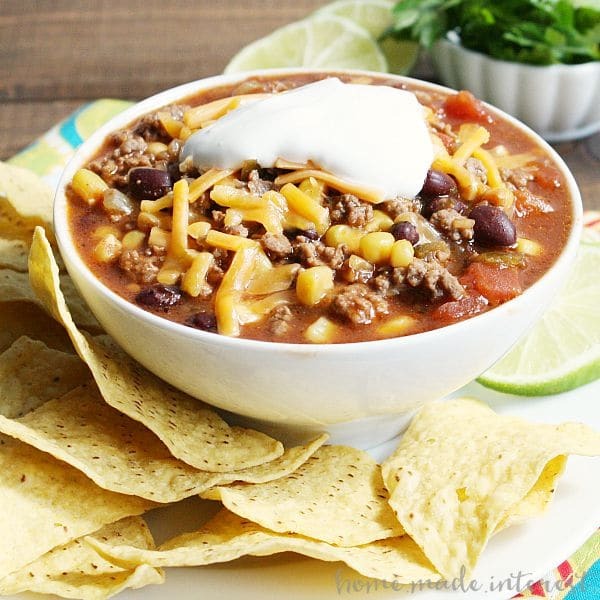 How to Make Slow Cooker Taco Soup? The only stovetop cooking you have to do is browning the ground beef with some diced onions. Then all of the ingredients are poured into the slow cooker and you set it to cook for 4 hours on HIGH. Don’t forget the tortilla chips! I like to scoop my soup up with them, or if I’m feeling lazy, I crumble them into the soup like tasty tortilla croutons. Yes, you can use ground turkey or chicken if you prefer. Can I Make This in My Instant Pot (Electric Pressure Cooker)? You can make this taco soup in your Instant Pot and we’ve already done the recipe conversion for you just check out our Pressure Cooker Taco Soup. 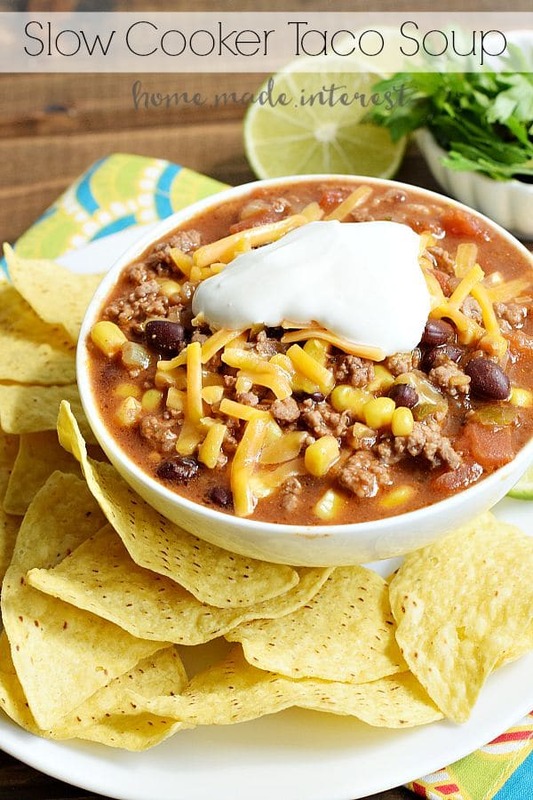 This easy slow cooker taco soup is packed full of flavor ! In a large skillet saute onions for 2 minutes. Add the ground beef to the onions and brown the meat. Drain browned ground beef and onions to remove the excess fat. 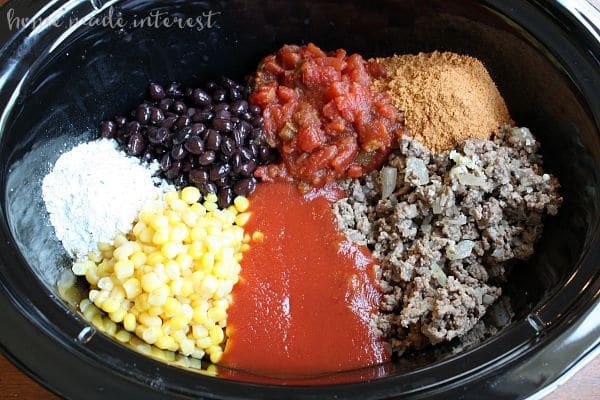 Add ground beef mixture and all other ingredients (do not drain corn or black beans) to the slow cooker. Note: The nutritional calculation does not include garnishes. A family favorite but I’ve never tried making it in my slow cooker. Brilliant! You’re gonna love keeping your stove turned off while it cooks! We love taco soup and I love to use the crock pot. Sounds like the perfect combination! Thanks for sharing! Yum….looks delicious – but much too hot here for soup! Enjoy! Did you drain the black beans and corn.before you added them? No you don’t . Thank you for asking I will add that to the recipe. I drained them and it still turned out great! I used Trader Joes 32 oz chicken broth. Was that the correct size? Yes, that is the size we used too. I’m so glad you made it and liked it! It is not hot, hot. We used diced tomatoes with jalapenos but if you are worried about heat just buy plain diced tomatoes. Oooh my! You got me here! I have a weakness for mexican anything and this looks absolutely amazing!!! Pinning! I love using my slow cooker especially when the temperature is 100= degrees. This recipe sounds amazing. Come share it with our party-goers at Snickerdoodle Sunday. We will be partying each week at 3PM Saturday until 8PM Monday. Taco soup…now this is awesome. We seem to be in a bit of a Friday night Mexican right now, so I think I have to add this to the list! This looks good! Taco soup is a favorite of mine! This was so good my family would not stop eating it!!! I’m so glad they liked it! I can’t wait to try this! What kind of taco seasoning packets do you use? We used Mccormick taco seasoning, but any taco seasoning would work. I made this and it was fantastic! Janice, so glad you enjoyed it! Made it but used rotisserie chicken breast. Fantastic also. Thanks for the recipe. Great idea!! I love rotisserie chicken! Making this taco soup right now and it smells delicious! Mine came out soupy? How can I thicken it up? Hi Christy it is a soup not a stew so it isn’t thick. I often crush up some tortilla chips into my bowl of soup which would make it thicker otherwise I don’t think there is much you can do at this point. You could use less liquid next time. Can you use another kind of beans, such as Ranch Beans or Pinto Beans, as my husband does not like Black Beans. Would love to try this this week-end, but not with black beans. Please let me know soon. Thanks and Blessings to you. Sure, go for it! Let us know how it turns out. I use the Bush’s SW beans-we love them! I’m sorry Mary. Hopefully low sodium broth will help. You can also use low sodium beans and no salt added corn. I use low sodium chicken stock, 1 can of rinsed black beans, 1 can of rinsed dark red kidney beans and 1 can of Ranch beans not drained. I also add an extra 32 oz of diced towmatoes and I put 2 cans of rinsed whole kernel Corn, plus 1 can Rotel original tomatoes. We love beans but you could add another lb of meat. I like less salty bc the chips are salty. We like Mission brand strips (less salty). Hello! Question for you… I hate everything Ranch flavored. (Sorry!!!) Can you taste the ranch dressing packet flavoring in this or is it just a flavor booster? I’d love to try this recipe but don’t want to waste time and money if I won’t enjoy it. Thanks so much!!! In the soup it just boosts the flavor I don’t think you taste ranch at all. Loved this recipe for tailgating! We are cilantro lovers; so we added it as a garnish too. It was a huge hit. My crockpot was completely empty. Mmm me too! Cilantro is the best! How big of a crockpot do most use, I have a smaller 4qt. Hi Steve, mine is a 5 quart slow cooker and this recipe didn’t fill it to the top so I think a 4 qt will be fine. This was delicious! Made it with venison because we have so much! It was fantastic!